If you're viewing this item, chances are you're like the countless other people we run into who have a cracked, leaking, or otherwise bad catalytic converter on their vehicle. 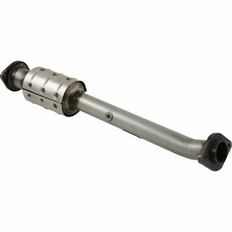 Pacesetter has your solution with this bolt on direct replacement catalytic converter. Simply unbolt and remove your bad converter and attached piping, and reinstall the new Pacesetter converter and attached piping. You'll be back on the road running as good as new in no time. The part number for this item is 324267 and it fits 2005-2010 Nissan Frontier, Pathfinder, Xterra and 2009-2010 Suzuki Equator (4.0 V6 Models). This is the PASSENGER SIDE Only.